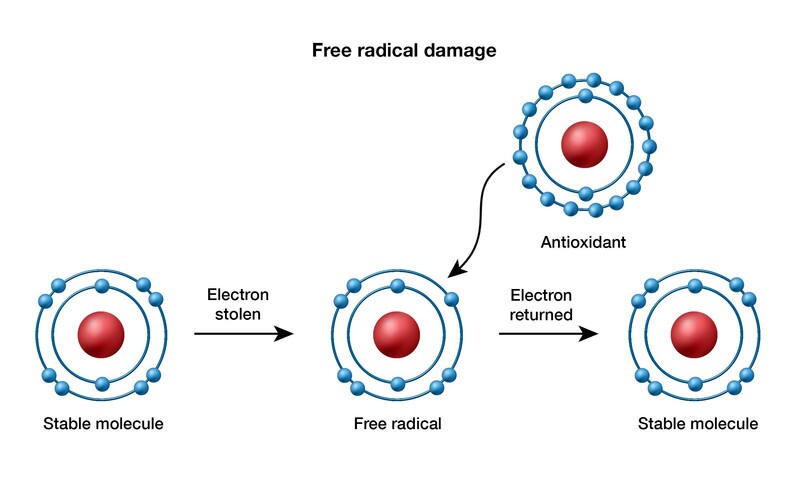 Free radicals are molecules that have one or more unpaired electrons making them highly unstable and reactive with other molecules. Free radicals are generated by the sun’s UV and infrared rays, pollution, stress, alcohol and smoking. How do free radicals damage the skin? Antioxidants are molecules that prevent oxidative reactions by donating an electron to a free radical without becoming destabilized. Antioxidants are sometimes referred to as “free radical scavengers”. Different antioxidants work via different mechanisms to neutralize damage. There are five antioxidants naturally found in the body: ascorbic acid (vitamin C), tocopherol (vitamin E), alpha lipoic acid, glutathione and ubiquinone. Antioxidants are the skin’s natural way to protect itself from free radicals. But daily exposure to free radicals causes this supply to dry up, making supplementation essential. Topical antioxidants have been shown to protect skin from damaging free radicals caused by UV rays. AlumierMD sunscreens and other formulations are packed with a wide array of skin-shielding antioxidants. A recent study from Yale University published in the Journal Science (2015) showed UV-induced free radical damage to DNA continued for hours following sun exposure. This finding indicates that damage continues to occur when you are indoors, “in the dark”, after spending time in the sun. The UV energy absorbed in melanin sets up a series of chemical reactions. When UV rays hit our skin, they can cause DNA mutations. Melanin has been known to protect the skin by absorbing the radiation. But what happens to the energy that gets absorbed by melanin? The study from Yale University showed the high-energy melanin sets up a series of chemical reactions, creating a very high-energy molecule that breaks apart and releases the energy holding it together. They propose that reactive oxygen and nitrogen species induced by UV rays excite an electron in melanin. This energy is then transferred back to DNA, causing the same damage as UV rays but in the dark. Further research is needed in this field. However, we can best protect ourselves by using an antioxidant-rich broad-spectrum sunscreen with an SPF of at least 30. Applying an antioxidant serum following sun exposure could potentially stop some of the continued free radical damage. AlumierMD products are packed with antioxidants. View AlumierMD’s Featured Antioxidant Products.